It has been a few months since I've been out doing any kind of astrophotography, as I was very busy and the summer sky weather didn't cooperate much. 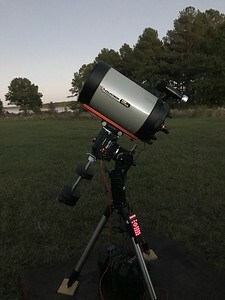 Last night, I ventured out with a few club members, to our astronomy clubs Bigwoods Road observing site on Lake Jordan, for a night under the stars. While a little chilly later in the evening, the weather and seeing were great! 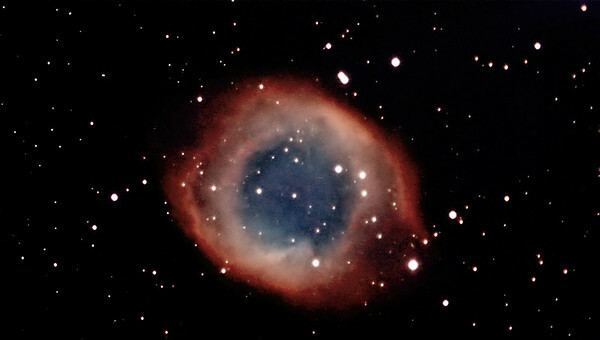 This capture is of the Helix (a.k.a The Eye of God) Nebula NGC7293, located in the Constellation Aquarius. It's around 10,000 years old, and is at least eleven times the size of our own solar system. This very large planetary nebula is around 695 light years away from planet earth. It's a dying star once very similar to our own sun, that refuses to go quietly into the night. The colors that see here are close to true, and are the result of different high speed ionized gases emanating and mixing from this old star. I used my Celestron 11" 2800mm reflector, in HyperStar configuration, to capture this deep sky object. The effective focal length, with the Hyperstar in place, is 560mm at a super fast f/2. This was also a "first light" test of my new ZWO ASI290MC-cooled camera. I specifically went with this model, as it's 1936x1096 sensor and 2.9um pixel size matched very well with my scope/hyperstar configuration. The scope and was mounted on an Atlas Pro AZ/EQ-G Mount, and guided using an Orion 50mm and StarShoot Guide camera. I've very happy with tha Atlas, and it continues to amaze me with the weight that it can support. With everything that I put on it, the guiding always seems to do well. I've included a PHD2 screen shot to show what I mean. My initial polar alignment was done using the amazing Polemaster Polar Aligner. Capturing was done using SharpCap software on a Windows operating system. Captured 46x30sec lights. Unfortunately, I had an issue trying to capture darks, so I skipped it. I'm still trying to formulate an approach for capturing Flats with the Hyperstar in place. Post processing was done using PixInsight and Photoshop CS6. 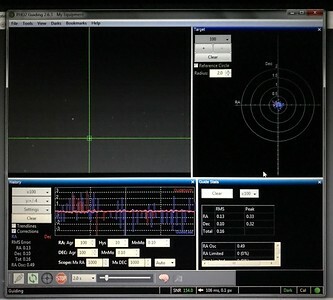 Guider output from mount during the night.